How good are you at keeping promises? Do you only make ones you know you can keep? Do you stick to promises you’ve made rigidly? Or do you try to back out of ones that in the cold light of day seem ambitious or a mistake? Lord God of Israel, no other god in heaven or on earth is like you! You never forget the agreement you made with your people, and you are loyal to anyone who faithfully obeys your teachings. 24 My father David was your servant, and today you have kept every promise you made to him. 25 Lord God of Israel, you promised my father that someone from his family would always be king of Israel, if they do their best to obey you, just as he did. 26 Please keep this promise you made to your servant David. 27 There’s not enough room in all of heaven for you, Lord God. How could you possibly live on earth in this temple I have built? 28 But I ask you to answer my prayer. 29 This is the temple where you have chosen to be worshipped. Please watch over it day and night and listen when I turn toward it and pray. 30 I am your servant, and the people of Israel belong to you. So whenever any of us look toward this temple and pray, answer from your home in heaven and forgive our sins. 41-42 Foreigners will hear about you and your mighty power, and some of them will come to live among your people Israel. If any of them pray toward this temple, 43 listen from your home in heaven and answer their prayers. Then everyone on earth will worship you, just like your people Israel, and they will know that I have built this temple to honour you. 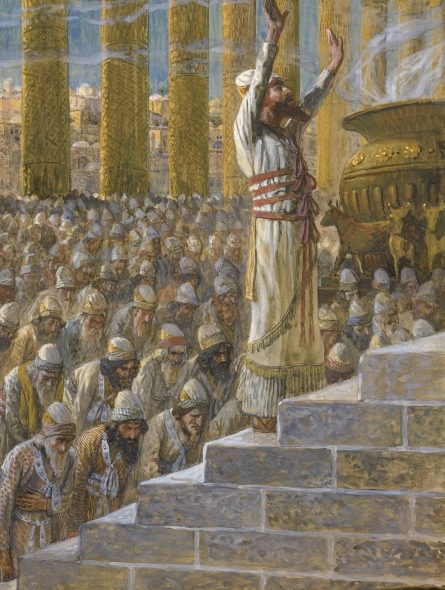 Solomon comes to pray in the Temple he has had built for the glory of God. As he does so, he remembers God’s faithfulness and acknowledges that he has always done what he had promised he would. And then he prays for that to continue. He praises God, “Lord God of Israel, no other god in heaven or on earth is like you!” (v23), and “There’s not enough room in all of heaven for you, Lord God.” (v27) Solomon comes in praise, wonder and worship of the God who is so vast, so majestic – and yet is still interested in one man. He comes aware of his need for forgiveness from his sins, “So whenever any of us look toward this temple and pray, answer from your home in heaven and forgive our sins” (v30); “ Listen when anyone in Israel truly feels sorry and sincerely prays with arms lifted toward your temple” (v38). He is aware of so much that can go wrong in people’s lives and their need to return to God and ask his forgiveness. He prays for God to be worshipped and honoured, “Then everyone on earth will worship you, just like your people Israel, and they will know that I have built this temple to honour you” (v43). The Temple is not to show off Solomon’s building skills, or the splendour of Israel, but the glory of God alone.